This was one of Sierra's favorite My Town apps so far. 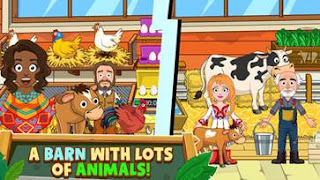 Sierra loves Farm Animals (well animals of any kind) so she really had a lot of fun with the different farm animals that are in the game. She loved feeding and caring for her "many" animals. 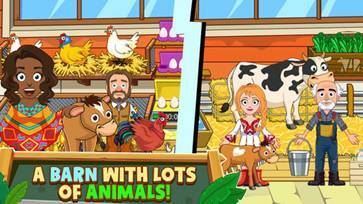 Mommy is glad this is a virtual world I could never help her take care of that many farm animals in real life! 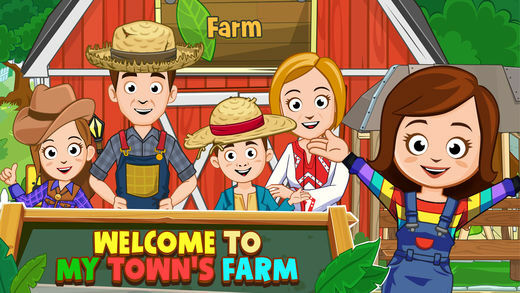 The six different locations in My Town: Farm offer all you need to create brand new stories for your favorite My Towncharacters, and even add some new friends! When you need supplies or perhaps want to show off your crops, you can head over to our super special farmer’s market. Whatever location you choose to explore, there are hours of fun ahead! NewCharacters – If you have My Town: Home (FREE to download! ), My Town: Pets, My Town : Museum or My Town : Haunted House, you can bring your characters from that game over to My Town: Farm to join the fun! The farmer just might want to find a new pet in My Town: Pets to visit the farm! Created by an expert team of designers, engineers, programmers and artists, loved by kids and parents alike and endorsed by teachers and therapists, My Town Games is a safe, digital platform that gives children hours of open-ended play to teach them to interact first with an imaginary world, which can then empower and embolden them to explore their physical world and learn how things work. In the My Town Games world includes 104 locations, 50 characters and 5300 plus objects and counting. 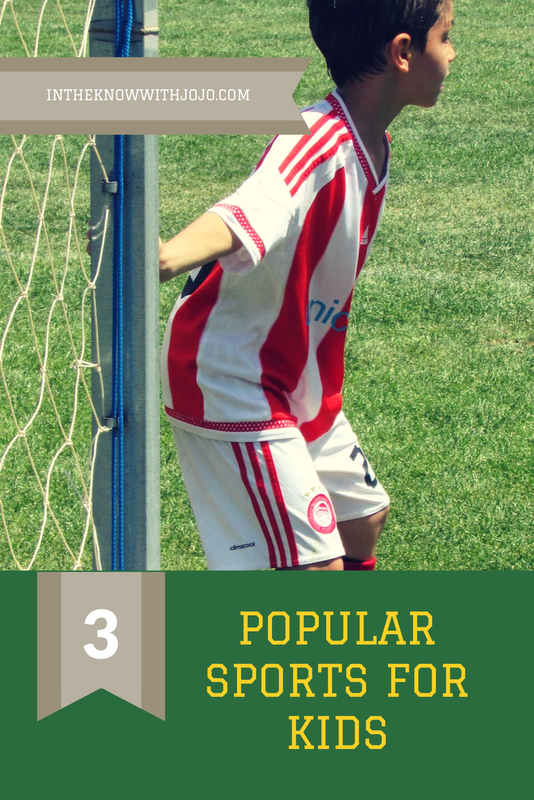 Kids ages 4-8 play and interact with a variety of things in places and with people they see, recognize and know in their real, everyday lives like their homes, communities, family, friends and neighbors. The My Town Games studio designs digital dollhouse-like games that promote creativity and imaginative interactive play for young children all over the world. Since launching they have built games that have been downloaded 13 million times in 200+ countries. Loved by children and parents alike, the games introduce environments and experiences for hours of open-ended gameplay. The company has offices in Israel, Spain, Romania and the Philippines. Visit My Town here. This is such a cute app. The kids love it. They do not have a spinner. I think it's always a good idea to make learning fun and they seem to achieve this and it looks like it can go on indefinitely with all the locations, characters and objects...good on them. no fidget spinners here.